After realizing how much stuff you need when you have a baby, I decided to have a traditional baby shower. Also, the older I get the more I appreciate reasons for bringing my friends and family together for a party they can't make excuses to get out of! I immediately knew that registering at Toys'R'Us wasn't going to work for me, since they don't always have the best prices and they don't carry every brand. That's when I stumbled onto BabyList. 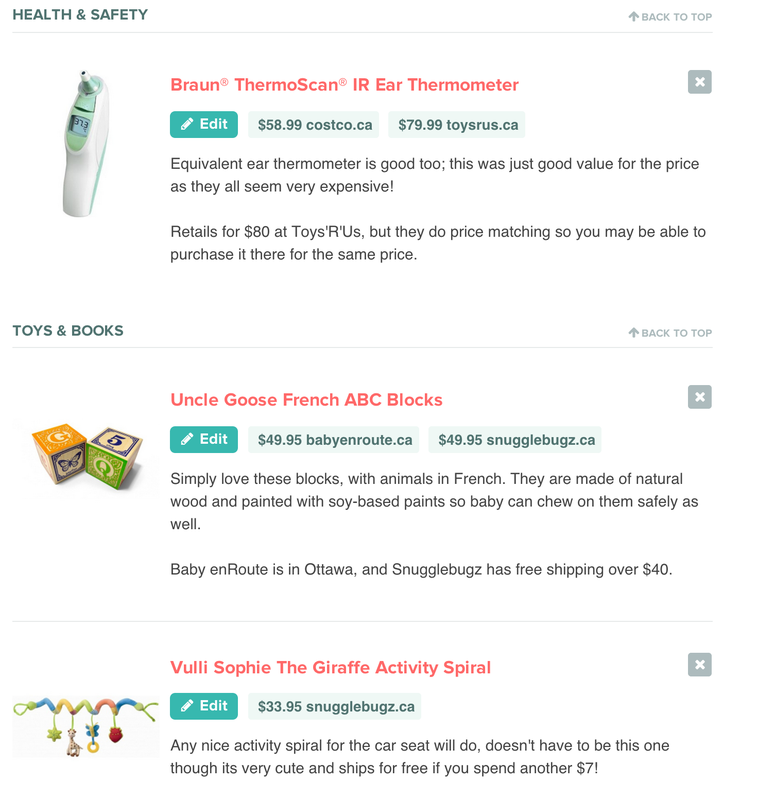 BabyList allows you to put anything onto your baby registry from any store. It can also link to other baby registries. If you decide to go with this option, you really need to decide the best way to use it for you. There are two main options, of which I chose a hybrid. 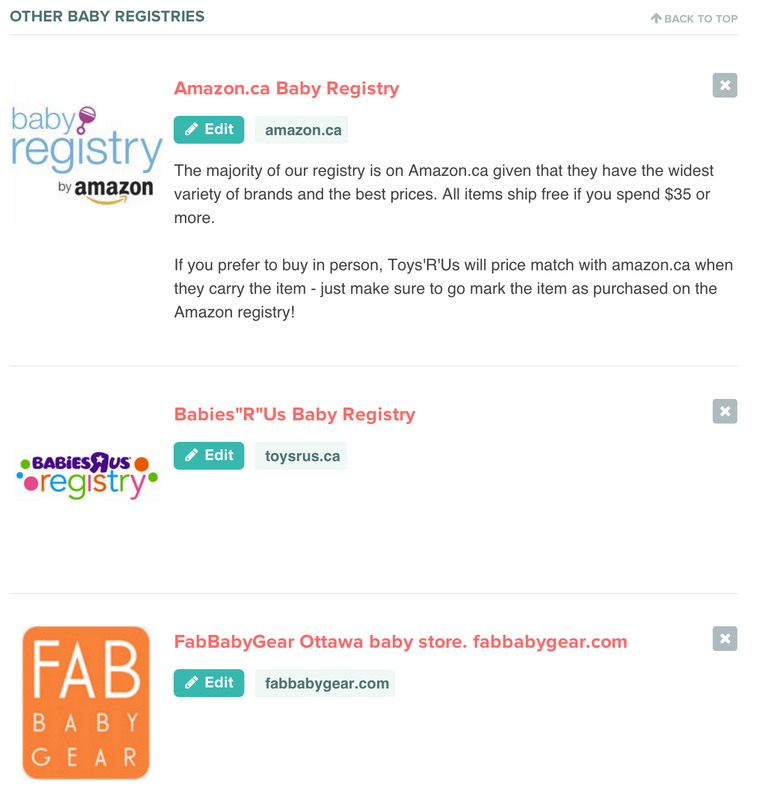 Don't include any individual items on the BabyList registry, just link to multiple other registries as you create them on each individual site. The upside to this approach is that you benefit from any perks that these other registries might have. for instance, Toys'R'Us gives you a welcome package with samples, coupons and even a bottle to use when baby is born. Moreover, some registries have completion discounts, so you can purchase anything you don't receive at your shower for a discount, usually about 10%. The downside is that people have to wade through multiple registries to decide what to get you, and they can't just print off a single list. But they can decide on a store that conveniently located for them and head off to that store and get the staff there to help them, which some people will appreciate. This is what this option looks like. You'll see that you can optionally add comments for each registry, as I did for Amazon.ca. With this approach, each item is listed on your BabyList registry, so people have one single consolidated list to print and purchase from. Additionally, you can list up to two stores for a single item, so people can decide where its most convenient to buy that item and watch out for sales. An additional benefit is that you can be more generic with your items. Want 10 onesies size 0-3 but don't care exactly which ones you get or which store they are from? Create a generic posting and let your friends and family decide for you. You can even upload any picture you like for it. The drawback of this approach is that you don't benefit from any of the baby registry perks you would have had you used their baby registries. Also, if you go in store to select items, you then need to manually add them to BabyList. For well known stores like Toys'R'Us they do offer one-time import options which can help with this process, but there is no ability to continuously sync between registries. This is what this option looks like. You can see that items can be listed by category, and you can even reorganize the entire list to determine the order each item should show in. Adding items to your registry is easy. I've added a button at the top of my browser which allows me to add any web link to my registry. Additionally, they have iPhone, iPad and Android apps that can be used. It's a little more complex, as you need to copy and paste the link into the app or browse for products directly from the app in order to add them to your registry, but it definitely works as I've used it on multiple occasions. BabyList doesn't impose either of the above options. You can add items and list them as a baby registry or as an item in a particular category, which makes it very easy to use a hybrid approach. If you choose to use this option, I recommend limiting the number of other baby registries you maintain to 1 or 2 as well as double listing some of the important items you want to ensure you receive, such as your car seat and crib. For double listings, you'll need to ensure that you update the duplicate registry if the item gets purchased. For instance, if you receive a notification that an item was Reserved on BabyList, and this item is also on your Toys'R'Us registry, you'll need to log into your Toys'R'Us registry to mark it as purchased. I originally set out to use Option 1, with a few items individually listed on BabyList. Family members had difficulty navigating the list and the feedback was that I have "nothing on my registry." I suspect in some cases they didn't understand that there were many big items on the Amazon registry that weren't listed on BabyList, so they only saw what was on the main BabyList page. If you want the very simple approach, I'd recommend option 1. You can shop in store, manage each registry individually, and never have to log back into BabyList once you've set it up to link to your registries. If you want to make it dead easy for family and friends to buy stuff for you and see it all on one place, I'd go with option #2. Alternatively, you could do a very simple hybrid: link to the Toys'R'Us registry and option #2. Then you get the Toys'R'Us perks and your older relatives can go in store and get a printout which they'll be happy about. And if you want to provide the best experience to your friends and family and get the perks, go with a hybrid approach and manually sync purchased items between registries. This option is not for everyone, so be careful if deciding to do so as if you don't keep it up, you could end up with duplicate gifts. If you fill out the form on their website, BabyList will send you free cards to include in your invitations. These are really cute, and though I used Evite to invite people to the baby shower, I kept a few on hand to help answer questions when people asked about the registry. It really does help to make it feel official. BabyList has truly outstanding customer support. They answer questions via email very quickly (always within 24 hours) and are even willing to do some of the manual porting of your registries to your BabyList registry if you're having trouble. You can opt to receive emails when someone reserves an item for you. You can choose to check which item was purchased, and also from whom, but you don't have to. I've been choosing to see what gets purchased so I don't buy it, but not checking who purchased it so I am still surprised at the baby shower! BabyList sends a few emails with tips and tricks, only about one a month, which is great. At that rate, I've actually bothered to read them. They sent me one in particular which saved me $300, informing me that my insurance might cover the cost of my breast pump. As it turns out, it did. Thank you BabyList! If you're in the US, or willing to order products from the US, they also on occasion provide discounts for some of their partners. Americans can also benefit from the BabyList Registry Completion Discount.